Click on the Find an Answer button to visit the Knowledge Base where you can look through our categories or view recent and popular articles. You'll find answers to common questions, how-to guides, troubleshooting information, useful links, and more. Click on the Request a Service button to visit the Service Catalog where you can look through our services or view the new and popular services. You can view your recent requests by clicking the My Requests button. 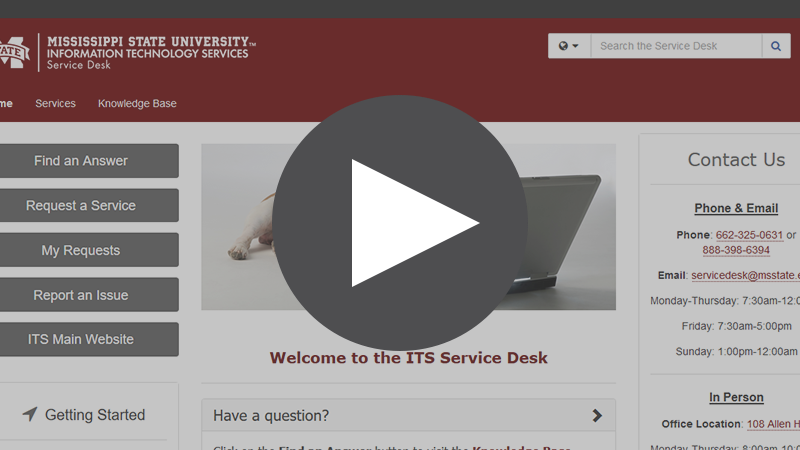 Click inside the "Search the Service Desk" box at the top and perform a quick search. Click on the globe to the left of the search box to limit your search to just the Knowledge Base or Service Catalog. You can also view our Getting Started video and articles if you're having trouble finding your way around.